Mia's Domain: Tofutti, Tofurkey Or Turkey? 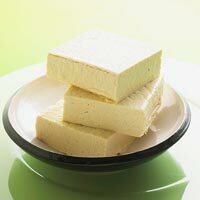 As one of the most popular vegetarian proteins on the market, tofu is a common substitute for the holiday turkey. Angelenos eat tofu for many reasons, one often being the belief that this is better for the environment. Consider, though, that much of the soy used to make tofu is genetically engineered, also known as genetically modified. Genetic engineering (GE) is defined by the USDA as "manipulation of an organism's genes by introducing, eliminating or rearranging specific genes using the methods of modern molecular biology, particularly those techniques referred to as recombinant DNA techniques." In other words, genetically engineered foods have been altered in a laboratory setting, often having genes forcibly introduced from other species. Critics of genetically engineered foods have concerns about the environmental impact of these plants in the food web. Since a large part of the soy available on the U.S. market is genetically engineered, vegans and vegetarians concerned about culinary environmental impacts should do their research and be wary of genetically engineered tofu. Tofurky brand products are all based on organic, nonGMO soy protein.